Ivory lace wedding invitation which opens like a book. The watermark shows the name of the papermill on the card. A thin fretwork, which resembles an antique lace, created by laser is present at the centre of the card. Square, ivory envelope 16x16cm. 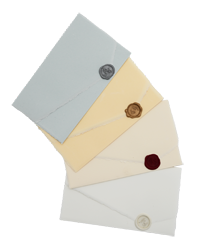 The watermark is visible on the envelope. Ivory invitation 8,5x11,5cm. The invitation can be made into a confetti card by dividing it into three parts.